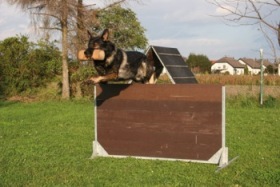 Von Forell acknowledges that you want the very best from your next competition dog. One of the difficulties you will find when searching for that very special puppy is navigating your way through all the clutter in order to choose your next champion. Von Forell identifies that selection is based on certain physical and behavioural character traits that should fall in line with your competition requirements. How do you choose the right puppy? How much prey drive is really necessary? What sort of temperament do you really need? Why is health so important? Why structure plays an important role in quality performance? What Guarantee do I get that my Von Forell puppy will perform the way I expect? Is environmental & social stability important in the final analysis? Why is self confidence so important? Does my dog need to be adaptable? Von Forell competition dogs are for competitive enthusiasts that demand driven dogs and truly enjoy a challenge. Although our dogs are equally suitable as a family companion, they do require tolerance and finely tuned handling skills. We have not left a stone un-turned, World-wide in our quest to find the finest dogs with working Genetics and you don’t need to be concerned of whether your next puppy will have the required traits. We are positive that you will be more than happy with a Von Forell puppy and to ensure that you get the very best selection that suits your requirements, we would love to know more about you and what you demand to see in your next working candidate.